Lisa Schlein describes the origin of the word, "cancer." CHAMPAIGN, Ill. — Graduate students pair powerful images with compelling descriptions of research in the 2017 Image of Research competition. Here are three of 20 graduate student finalists, with descriptions by the researchers. For more details about the competition, see the Editor’s note, below. Hippocrates chose “karkinos” to describe a disease in his patients. Perhaps this was because tumors physically resemble these crustaceans: hard in the center, sending elaborate finger-like cellular and vascular projections in all directions – analogous to the spindly limbs of a crab. Whatever his reason, the word “cancer” has remained in medical parlance for millennia. As a future veterinary pathologist and cancer researcher, I hope to improve treatment outcomes for cancer patients, and in my current graduate work, I am evaluating a novel therapeutic for brain cancer. 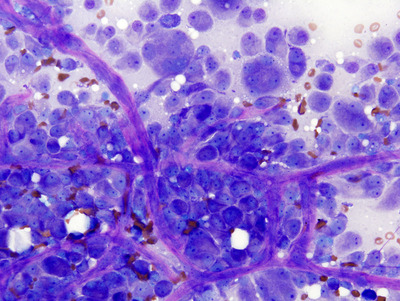 One day at the microscope, I came across this intricate array of blood vessels nourishing cancer cells in a tumor from a dog (image above). To me, the image is both terrifying and beautiful: The cells have many microscopic criteria of malignancy, yet they artfully unveil their history. If you look carefully, you will see that the fine, pink blood vessels outline the silhouette of a spotted crab, camouflaged amongst variably sized, speckled stones. Novel imaging techniques are necessary for examining whole-brain protein expression patterns. Animal brains are large, complex structures that are difficult to image comprehensively. Neurons can be several inches long, while only a few nanometers in width, and can branch in many directions connecting different regions of the brain. Laser light has trouble penetrating the dense, opaque tissue, which usually means brains can only be imaged in extremely thin slices that fail to image complete cell processes. Christopher Seward describes work to visualize an intact mouse brain. To solve these problems, we have modified a technique called CLARITY that allows us to make a whole mouse brain completely transparent, while keeping fluorescent labels intact. This process allows us to visualize the connections of an intact brain at extremely high resolution in three dimensions. The goal of our study is to identify the proteins activated after a social stimulus, such as an intruder in an animal’s home. This image shows inhibitory neurons in green and neuron bundles expressing a protein that is triggered by a social experience in red. 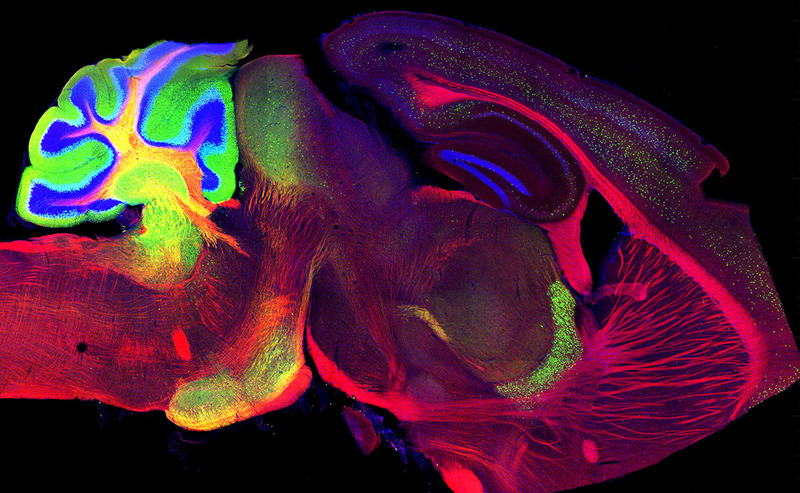 The blue background stain reveals important brain structures. These images allow us to connect the expression of a gene in one area of the brain, and follow its signal to other areas. As master's student in social work, my heart reaches out to those who suffer the effects of major depressive disorder. It has been estimated that around 14.8 million adults living in America are directly affected by this diagnosis. Symptoms of MDD include energy loss, feelings of worthlessness, helplessness, loneliness, extreme sadness and fatigue. For Elizabeth Weston, this image evokes the power and mystery of depression. In a world surrounded by beauty, those suffering from MDD experience life in a different way. The darkness that covers the tiny farm house in this photo represents the individuals who feel the crippling effects of MDD. 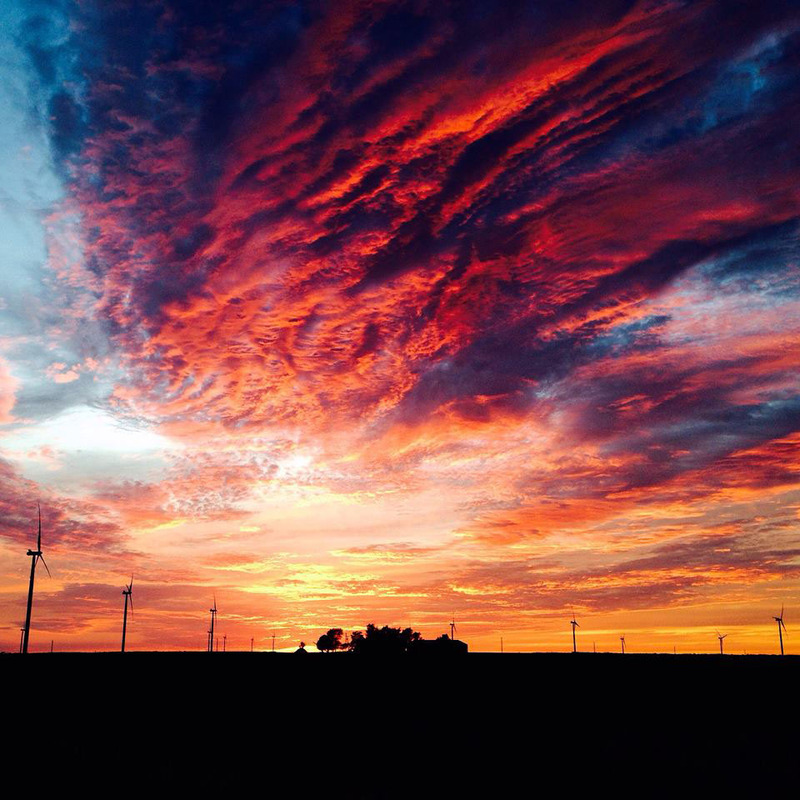 The beautiful colors that engulf the sky represent the rest of the world and those who might not understand major depressive disorder and its effects on day-to-day life. By collaborating with mental health professionals, organizations and various media outlets, we can bring light to the overlooked topic of major depressive disorder to reduce stigma, provide help and become a united front in the field of mental health. The Image of Research is a multidisciplinary competition celebrating the diversity and breadth of graduate student research at the University of Illinois at Urbana-Champaign. The semi-finalists have been selected based on their submissions’ originality, visual impact and the connection between image, text and research. The Image of Research is organized by the Scholarly Commons of the University Library and the Graduate College, and is supported by a generous gift from the Division of Intercollegiate Athletics. To see all 20 semifinalists and for more details about the competition, go to The Image of Research website. Winners of the competition will be announced at a reception on Wednesday, April 5 from 4 to 6 p.m. in room 104 of the Illini Union, 1401 W. Green St., Urbana. Attendees will have the opportunity to view the finalist entries and vote for the People’s Choice award.